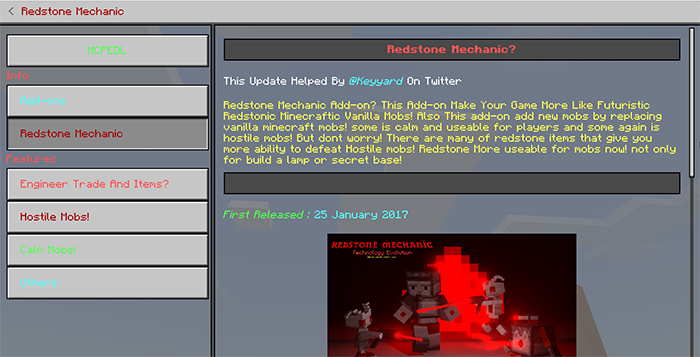 Redstone Mechanic is an add-on which replaces 25 vanilla mobs with awesome Redstone mobs! 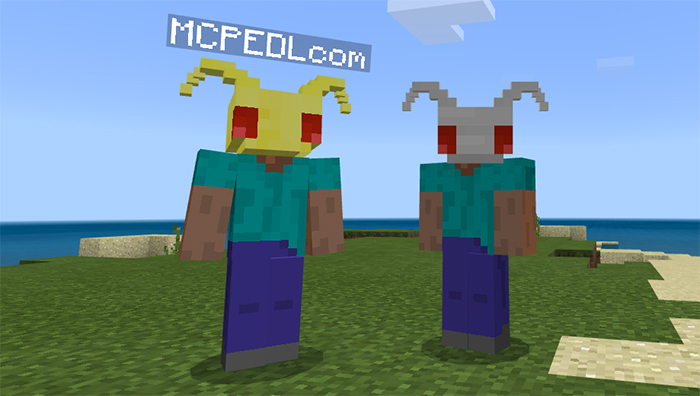 It also adds a whole bunch of new items such as underwater helmets and powerful weapons. You can also ride on flying chairs and cool motorcycles while fighting many of the different evil robots around the world. As a whole, it’s a really good add-on with lots of cool features which will greatly enhance your survival gameplay experience! Dispenser Robot: Shoots three different types of projectiles (arrows, snowballs or fireballs) at other mobs (not monsters) and players. Flying Chair: This is a mechanical chair which can be used by players for riding. A really cool thing is that it can fly! Simply press the jump button while seated to be launched up into the air and then just move in the direction you want to go. 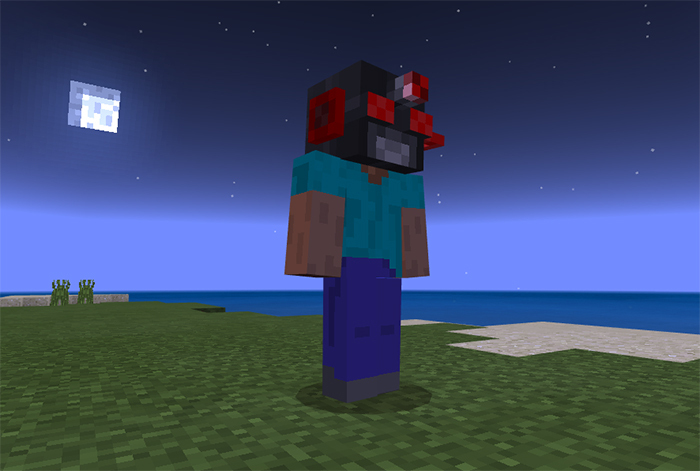 Observer Robot: This mob acts as a guard and will help protect the player against dangerous mobs. Once it starts shaking that means it will shortly explode and that you need to get away quickly! 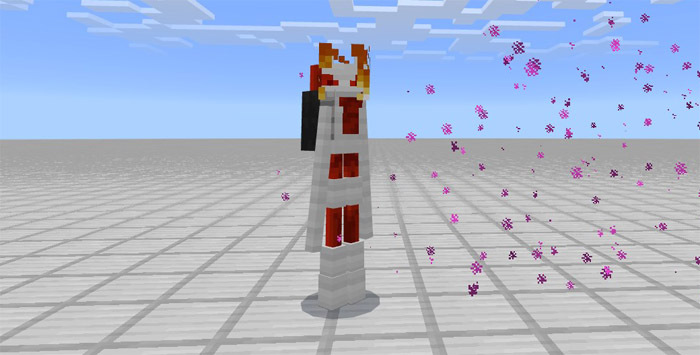 Redstone Turret: If a hostile mob is detected then it will start firing snowballs and arrows at the enemy. It’s very weak though so make sure to place it somewhere mobs can’t reach it. Hopper/Collector Machine: This is a complete new type of machine which works similar to a lawn mower. Even that isn’t a great description. 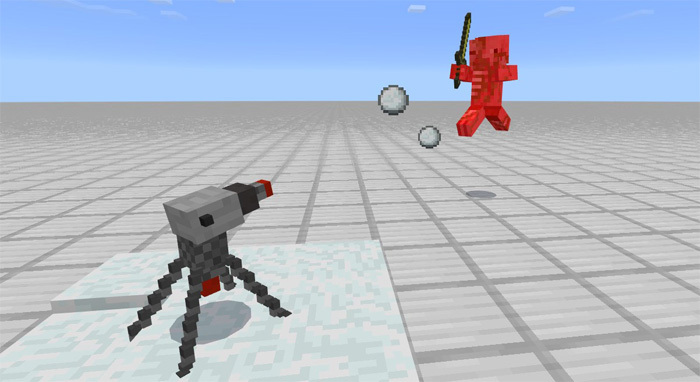 Redstone Destroyer: An enemy robot which will shoot snowballs at its opponent. 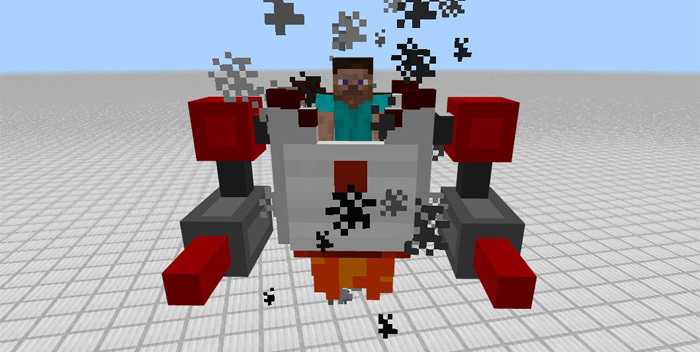 It will automatically try to ride a Redstone Motor if the difficulty level in the game settings is set to hard. 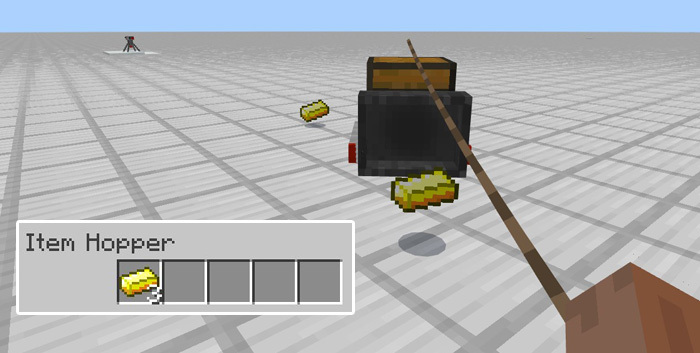 Redstone Golden Destroyer: It is similar to the Redstone Destroyer except that it is stronger and shoots fireballs. 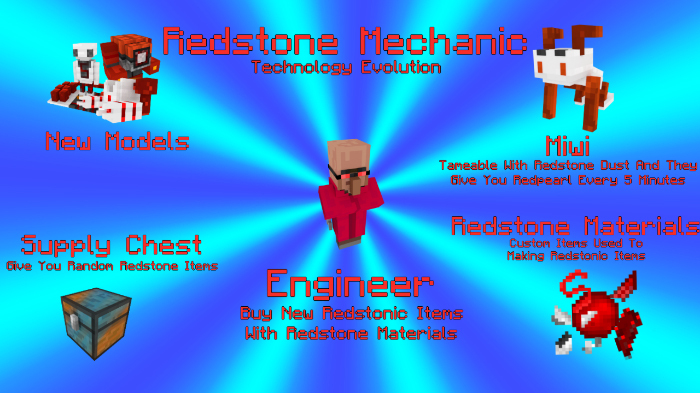 Redstone Motor: A new type of vehicle which can be controlled by holding redstone or a diamond or iron sword in your hand. You can boost it by tapping with redstone on the ground. If it dies it will explode. Dropper Robot: This robot only appears by giving a Dispenser Robot (creeper) a dropper block. But since the Dispenser Robot is hostile it’s not going to be easy. However, if you are successful, you will have yourself a Dropper Robot which will trade treasures (such as diamonds and gold ingots) for redstone dust. TNT Anator: This one is a hostile mob which will only spawn in the Nether. It shoots TNTs to attack its targets (which are mostly any living creature) and it is itself immune to TNT. Necrocircuit: The Necrocircuit is a hostile mob which can be found flying around in the Nether. It’s very strong and shoots three fireballs at the same time at its enemies. Legion: The Legion is a mechanic robot which stands several blocks high. As soon as it locks in on a target it won’t stop attacking it until it’s dead (or until it’s killed itself). Auto Scorpion: Watch out for the tail! It will sting you! If you get hit then you might get infected and get a poisonous effect for five seconds. Mega Auto Scorpion: The Mega Auto Scorpion is considered an extremely dangerous boss. It’s basically a much better version of the Auto Scorpion. Luckily, it spawns very rarely. Flyborg: The Flyborg is a hostile murder machine. Everything about it is pure evil. 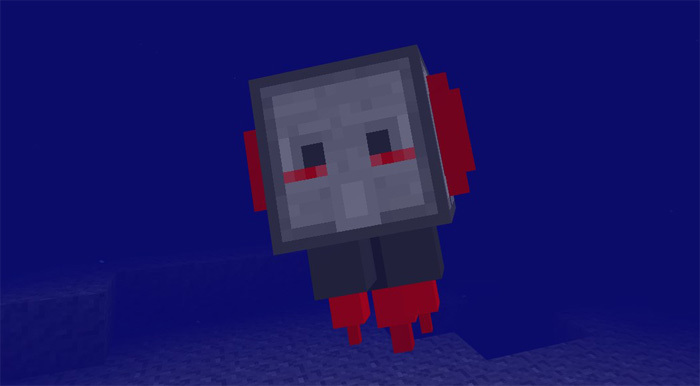 Pyroborg: This one is a hostile mob which can be found roaming the deserts of Minecraft looking for lost players to kill. Protector Bot: The Protector Bot is one of the most useful robots to the player. Not only will it protect you against hostile robots and monsters but it will also let you ride both on the ground and in air! Robot Workbench: This robot can be used for crafting any of the robots which are helpful for the players. V Mechanic: This robot is considered a boss and if you want to have any chance to kill him then it’s recommended that you make use of the Protector Bot. 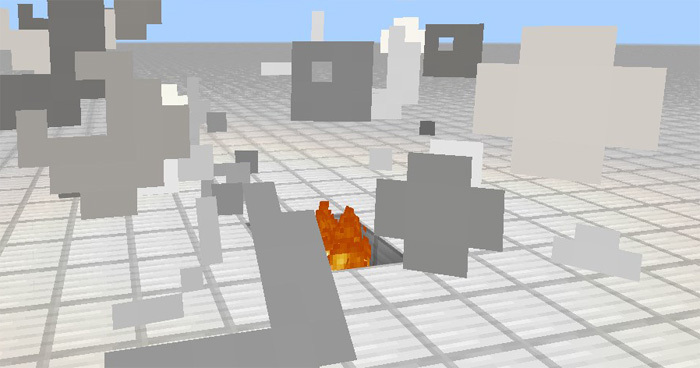 Octobomb: The Octobomb is a floating explosive bomb. If you hit it then it will immediately explode. Momotone and Kinotone: These robots aren’t much different from the Guardians which they replace. The main differences you will notice are their textures, models and health. Sea Destroyer: Dangerous hostile which lives underwater. Kills both fish and players. At a quick glance this mob looks like a rusty ordinary destroyer. Redstone Staff: The Redstone Staff replaces the Trident and has the same functionalities as the Trident. 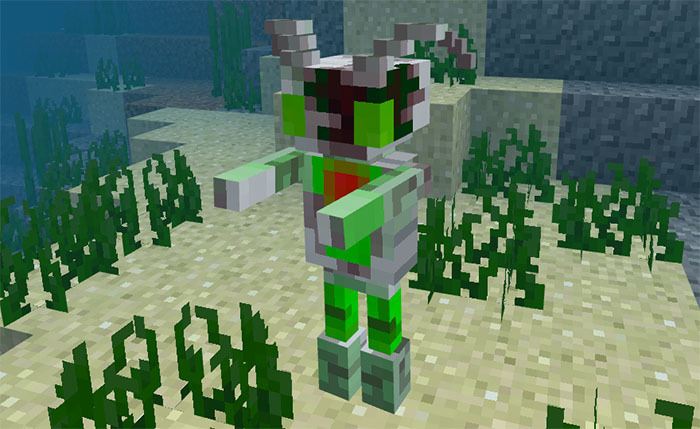 Miwi: The Miwi is a robotic rabbit which you can tame by feeding it some redstone dust. Once tamed, they will give you Redpearl Teleporter every 5 minutes. When the Redpearl (Ender Pearl) is ready it will start shifting colors. 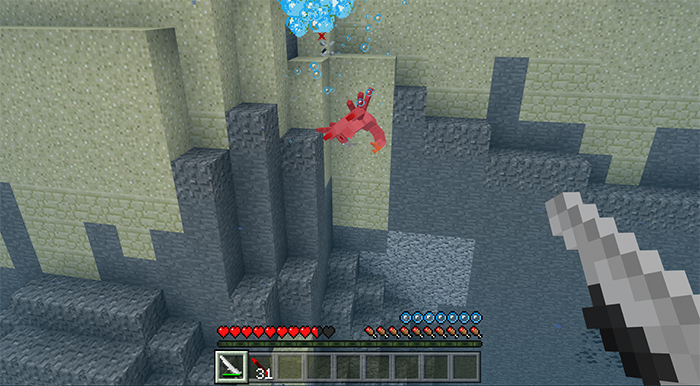 The Miwi spawns in most biomes such as flowered forests, deserts and snow biomes. The Technology Evolution update adds a bunch of new items. To obtain these items you will need to trade with an Engineer Villager (replacing Priests). Most trades require Redstone Material which is a new item you can get by killing the new mobs. Water Helmet: This is the ultimate helmet for exploring the ocean as by wearing the helmet you will be able to breathe underwater. Night Vision Helmet: By wearing this helmet you will get a night vision status effect. Perfect for going on late night adventures or exploring caves! Redstone Sword (replaces Fishing Rod) is a useful weapon against the robots. It can be used to electrocute your enemy by pressing the Electric Power interact button or long tap on the screen (or right-click if you are on Windows 10). Redstone Crossbow (replaces Bow) has very good gravity and attack damage, and it also has a very accurate aim. It requires Redstone Rods (Arrows) for firing. You can access a guide / documentation via the menu options in-game. There you can find out all you need to know about the add-on. Now Model for Dispenser and Dropper robot!